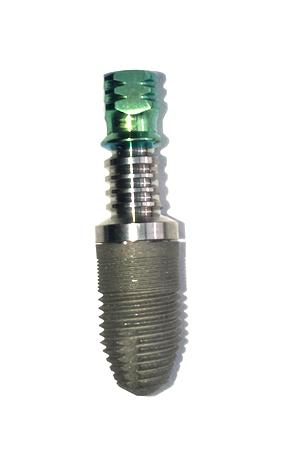 A dental implant is a small titanium rod with a screw on one end and a post on the other. The dentist will place the implant into your jawbone and then leave it for 3-6 months so the bone tissue can grow around the implant and ensure the implant will be ready to handle the forces of biting and chewing. A crown or fixed denture is then created to place over the implant post to complete the restoration. Is everyone a good candidate for dental implants? Most people are good candidates, provided they have healthy gum tissue around the site and sufficient bone material. You may not be a good candidate if you have diabetes, osteoporosis, have taken bisphosphonate mediations, are a heavy smoker, or have problems healing. Prevents bone loss in the jaw by providing the pressure and stimulation needed to maintain healthy bone. Dental implants are very durable and many will last a lifetime. A temporary crown will be used for 3-6 months until the implant has integrated into the surrounding jaw bone. 3D x-ray technology allows Boise dentists Dr. Crump and Dr. Harker to place dental implants with precision and accuracy available to few other Treasure Valley Dentists.